In the words of the 2004 Nobel Peace prizewinner, the biologist and environmental activist Wangari Maathai, “Climate Change is life or death. It is the new global battlefield”. Climate change is starting to show its impacts at many different levels: from climatic and environmental concerns, to social and economic effects. The Intergovernmental Panel on Climate Change (IPCC) stated in its latest report (IPC AR5, Summary for Policymakers, 2014) that “projected climate change will impact human health, mainly by exacerbating health problems that already exist” and also that “throughout the 21st century, climate change is expected to lead to increases in ill-health in many regions and especially in developing countries with low income, as compared to a baseline without climate change”. The MDPI Journal Climate (ISSN 2225-1154) recently published a comprehensive literature review on the topic of health effects of climate change, authored by a group of experts from the World Health Organization (WHO) European Centre for Environment and Health (Wolf et al., Climate 2015, 3, 901–936). This paper has attracted the interest of the scientific community, since it condenses the current knowledge on the effects on health of the global warming trends and extreme weather events under climate change projections in the WHO European Region. 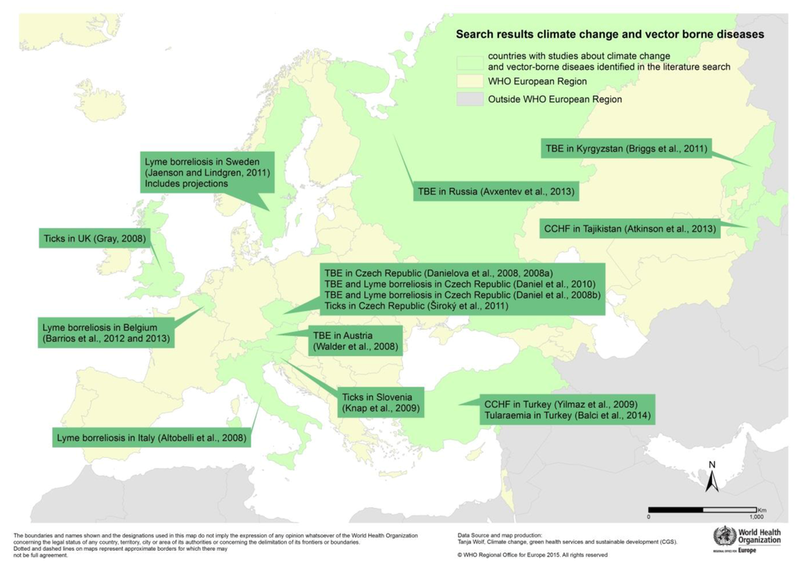 Four search algorithms allowed the authors to identify scientific contributions published between 2007 and 2014 that were focused on exposure to climate risks and health outcomes in Europe and Central Asia. After applying several specific filters, the 135 most relevant papers were included for review, comprising both the observed effects in recent years and the projected effects under different IPCC Emission Scenarios. The studies were split into two different groups according to whether they present direct or indirect health effects of climate change. The direct effects include all of those derived from high temperatures and heat, low temperatures and cold, floods, wildfires, and UV radiation. Heatwaves and high temperatures entail risks to human health, since several papers reveal their effects on morbidity and mortality in different European cities. Respiratory diseases, dehydration, hyperthermia, renal diseases, and cerebrovascular affections (among others) tend to rise during warm periods. Furthermore, heat-related mortality is expected to grow, especially in Southern Europe. In the same way, magnitude and frequency of heatwaves are projected to increase in the near future. Cold periods and extreme cold weather conditions may also be a threat to human health, since they are associated with an increase in hospital admissions, mortality, and morbidity—mainly due to cardiovascular, respiratory, and cerebrovascular causes. According to the authors, projections show a decreasing trend in cold-related mortality (following the temperature warming trends) in the EU along the 21st century. However, this reduction would not be sufficient to balance the predicted increase in heat-related deaths. Floods have become an increasing hazard in Europe, directly responsible for numerous deaths and damage in recent years. Health effects of flooding primarily consist of cardiovascular accidents, drowning and electrocution, injuries, and psychological impacts; as well as indirect effects, such as infectious diseases, food and water problems (contamination, quality, and supply), population movements, or health services malfunction. As climate models foresee a growth of extreme weather events, producing river and coastal floods (heavy rainfall episodes, snowmelt processes, sea level rise), millions of people in Europe are likely to suffer their impacts. Along the same lines, wildfire risk is expected to grow, particularly in Spain, Portugal, Italy, and Greece, resulting in threat to life and health, infrastructures, and agriculture. Regarding the indirect health effects, the authors classified them in four categories: climate-sensitive infectious diseases, food- and water-related affections, pollution-related, and allergic diseases. Temperature conditions and water availability are strongly linked to infectious diseases, the incidence of which in Europe may have been affected by seasonal and annual variations in the NAO patterns. Significant rates of mortality are related to vector-borne diseases transmitted by mosquitoes, sand flies, or ticks (whose survival and spread depends on climatic and environmental factors). The risk of occurrence for some mosquito-borne diseases (e.g. malaria or dengue), as well as tick-borne diseases (e.g. encephalitis, tularemia), may rise in different regions as a result of the increasing temperatures. Likewise, food- and water-related diseases (e.g. intoxication from cyanobacteria, salmonellosis, Legionnaires’ disease) can be influenced by climatic and weather events. Air pollutant emissions, such as nitrogen oxides, sulfur dioxide, carbon monoxide, and black carbon or other particulate matter, are related to cardiorespiratory diseases and allergies. Due to environmental policies and regulation, emissions in Europe have substantially diminished in recent times, however mortality associated with air quality may increase, as may allergic affections, particularly in urban areas. In light of these results, the authors conclude by recommending efficient mitigation and adaptation strategies in all sectors, in order to develop more “sustainable and healthy societies”. Posted in Climate, Editorial, Feature Highlights, MDPI News, Open Access Publishing, Peer-Review, Uncategorized and tagged Climate, Climate Change, IPCC, open access, WHO.